Explanation: Admire the beauty but fear the beast. 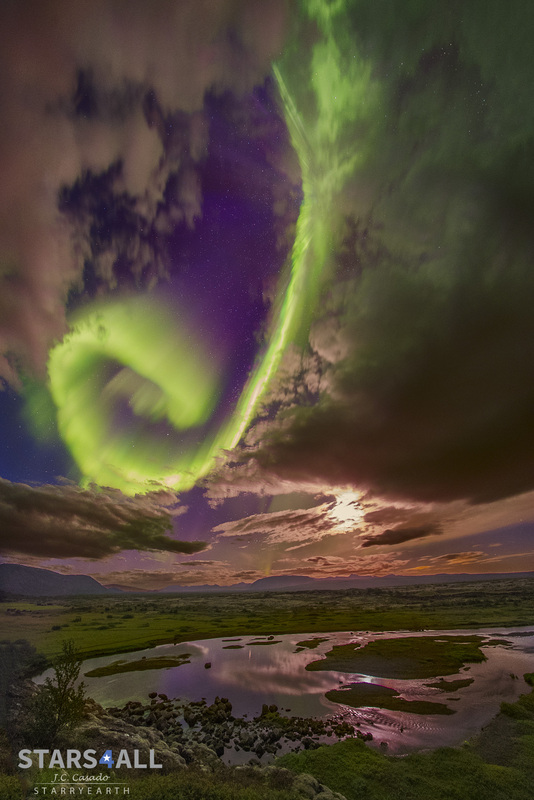 The beauty is the aurora overhead, here taking the form of great green spiral, seen between picturesque clouds with the bright Moon to the side and stars in the background. The beast is the wave of charged particles that creates the aurora but might, one day, impair civilization. Exactly this week in 1859, following notable auroras seen all across the globe, a pulse of charged particles from a coronal mass ejection (CME) associated with a solar flare impacted Earth's magnetosphere so forcefully that they created the Carrington Event. A relatively direct path between the Sun and the Earth might have been cleared by a preceding CME. What is sure is that the Carrington Event compressed the Earth's magnetic field so violently that currents were created in telegraph wires so great that many wires sparked and gave telegraph operators shocks. Were a Carrington-class event to impact the Earth today, speculation holds that damage might occur to global power grids and electronics on a scale never yet experienced. The featured aurora was imaged last week over Thingvallavatn Lake in Iceland, a lake that partly fills a fault that divides Earth's large Eurasian and North American tectonic plates.